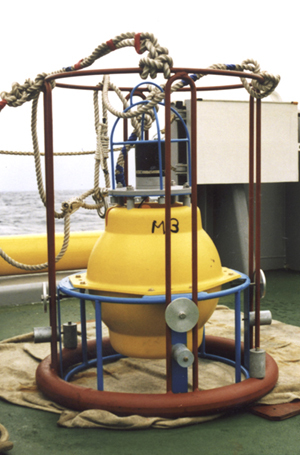 In this scenario, a minimum of three precision geodetic transponders are deployed on the observed seafloor. A surface station sends acoustic signals to the transponders to determine the accurate range. When the PMGS is Integrated with Kinematic GPS and Doppler compensation mechanism, the center point of the triangle formed by the geodetic transponders can be accurately determined. The accuracy in the shift of the center point is obtained after repeated tests over a period of time. This in turn determines the movement of the plate. 2. Placing two or more Precision Geodetic Transponders at subsea observation points on different subsea plates. The transponder interrogates others to measure the accurate range. A visiting vessel uploads the range information using LinkQuest underwater acoustic modems. By comparing the change in range over a period of time, one can determine the relative change in range among the plates where the different transponders are placed. 3. Placing an array of Precision Geodetic Transponders at sea bed. This application utilizes a towbody installed with Surface Geodetic Transponder to interrogate the array of transponders at seabed to determine the ranges. By maintaining a relatively stable depth of the towbody, distances among various subsea transponders can be accurately calculated after post-processing large amount of redundant range information. The distance information can be used to determine the movements of the seafloor where the transponders are placed.